Mom is often the most active parent in her family's spiritual life. She tends to be the one who engages with the children's ministry (kidmin) workers, knows what the kids are learning and helps with take-home activities. This observation held true when iMom founder Susan Merrill and her husband, Family First founder Mark Merrill, were raising their children, though, she acknowledges, that's not always the case. "I was usually the caretaker of the academics of the child," said Merrill, who has written several books, including From Me to You, conversational journals for parents to use with their children. "I was usually the more inquisitive one when it came to their biblical curriculum. Now, my husband was really great at doing devotions with our kids during the week, but I was probably more in tune to OK if our kid came home with a handout, making sure we incorporated that, so possibly expectations are a little different. It just depends on the parent dynamic of who handles what." Whether Mom or Dad takes the kids to children's church, their expectations may be low. "A lot of parents drop their kids off and really have no expectation other than that they they're going to get to hear a sermon and their kids are going to be taken care of," Merrill said. "I think some churches, especially with the younger kids, almost treat their children's ministry like that, like a daycare, compared to maybe in more traditional churches or churches of old where there was a plan for kids to systematically learn biblical principles as they matured." The transient nature of today's society has had an impact on the church. "We're moving from church to church," Merrill said. "People just move a lot in general today. Before with more traditional programs, if your child was there from 2 to 18, there was a plan for what they would learn." Children's expert and author Mary Manz Simon points out that more than just moms and dads have an interest in children's spiritual lives and that "issues related to faith and spirituality become more important" as we age. "For grandparents, that includes leaving a faith legacy ('faith footprints') or contributing to a faith foundation, especially for grandchildren," Simon said. 'Many grandmothers, especially, become prayer warriors for their grandchildren, as it is a way to be actively engaged in the spiritual welfare of the next generation. This often is an element of their personal faith-life expression and not something initiated by children's ministry." Author Marilyn Turk and her husband, Chuck, are raising their grandson Logan, almost 10 years old. Logan loves going to his children's church program. "The most important thing we think is necessary, in addition to sharing God's Word, is knowing the teachers love him," Turk said. "He has found a new family at church where most everyone knows who he is. He runs to certain workers or teachers to give them hugs because they care for him." One of the elements women seek out in a children's ministry seems obvious—good teachers. "I think finding good teachers and getting them to commit [is important], because there's no greater joy for Mom than for a child to pipe up in the middle of the week and say, 'Oh no, I can't do that because we learned that ... ,'" Merrill said. "The fruit of the child's growth is a product of the teacher's gift. If teachers are using their gifts, the children will grow if the parents are affirming at home." Merrill adds that moms should want "to know that my child is really going to learn something," she said. "And that learning is going to be the planned curriculum, kind of like elementary school is. They only get one hour a week in this versus school, so is it not more important that this curriculum be defined?" Author, speaker and former pastor Carol McLeod wants "a very Word-centered program" for the kids, but then pointed out the importance of the children's ministry leader knowing how to present the lesson according to the children's maturity. The worker "should be aware of 'how can I present the Word in an age-appropriate way?'" she said. "So you're not going to preach for 40 minutes. "My daughter is actually a preschool pastor at a church, and she was telling me how in their last planning meeting, the kids' pastor was talking about how they were going to teach about the woman with the issue of blood, and she told him, 'No, you can't talk to sixth-grade boys with that vocabulary.' Instead, she suggested, "the woman who was sick" or "the woman who had a problem with bleeding." As with all education, McLeod affirmed, "You've got to know who your audience is and be age-appropriate." Merrill calls on churches to define their curriculum and cautions against babysitting. "I've noticed a trend into very entertaining videos, and I have nothing wrong with being entertained," she said. "But some of them, I feel, are just an opportunity for the church to think they're turning on a TV, and it doesn't matter who the worker is because they're going to watch the TV, and that's just not true. But there really has to be teaching and application. ... I think kids need to be truly taught. And that means you can have them watch a part of our lesson, but too many bells and whistles almost distract from the lesson." Churches also sometimes teach children to minister to each other. "I love it that there are churches that are teaching the children to lay hands on one another and pray for each other," McLeod said. "I love it that we're teaching children how to hear God's voice. I mean, Samuel was probably between 3 and 5 years old, and he was hearing God's voice, and so I believe that training our children to hear God's voice is very exciting. At our church in Buffalo ... they had a seminar for the children to come to learn how to hear God's voice and then one for the parents on how to foster that in their children." She emphasizes that the Holy Spirit is for children too. "There is no Junior Holy Spirit," she said, noting the phrase is common. "There's one Holy Spirit, and the Holy Spirit is well able to talk to children just like He has to adults. What we have to do as adults is disciple and train because will there be times when children say something funny. Yes, but they need discipleship." Karen Whiting, author of many books, including 52 Weekly Devotions for Busy Families, appreciates seeing children learn by engaging in ministry. "It develops compassion and lets them follow Jesus in loving one another," Whiting said. "It's better to train them in basic Bible knowledge, loving one another and nurturing the fruit of the Spirit at younger ages." Merrill thinks churches should intentionally educate parents on the value of take-home activities to be sure the lesson sticks in the children's minds and hearts. "I almost feel like systematically, a church should have a meeting with the parents and say, 'This is our goal,'" Merrill said. "'This is how we teach your children. This is your part in this contract of parenting your kids and the church coming alongside you to do this.'" Take-home papers may not be used in the home as much as they used to be, though. "Because parents and so many grandparents are digitally active, take-home papers, except for coloring sheets during early childhood, are less popular than previously," Simon said. "Given the pace of modern life, 'do-at-home activities' are seldom used, even if congregations provide them online." To run an effective spiritual ministry for children, churches must train an adequate number of staff and volunteers for the age group they serve. "The number of children's ministry workers can limit the number of children who can participate," Simon said. "One trend we've seen is the down-aging of volunteers. In many congregations, fourth- and fifth-graders begin 'training' to become leaders for younger children. Mentoring programs have become far more sophisticated for middle schoolers and those in junior high." Turnover can be high, but Merrill thinks teachers must be willing to teach for a full year. "In the little bittys, you can have some turnover, and it's OK because they're not doing an in-depth curriculum that needs to be trained on," she said. "But when you get to elementary age, find that teacher who will commit and say, 'OK, I'm going to teach these kids for a year. I'm going to get to know the kids and going to make sure they're understanding concepts.' It's really hard to get someone to give up the year, but it's important." Whiting points to the need for adequate numbers of children's workers. "These can be teens too with at least one adult supervising," she said. "If parents think there are low numbers, please let them know and let them also be able to volunteer to fill in. That may mean having background checks on file." "Floaters" can also be a big help with overloaded classes. "As a church, you want to be welcoming to every type of child—autistic, handicapped," Merrill said. "And if I have an autistic child who's going to need more one-on-one direction, I've got to have people helping me." Training is also critical. 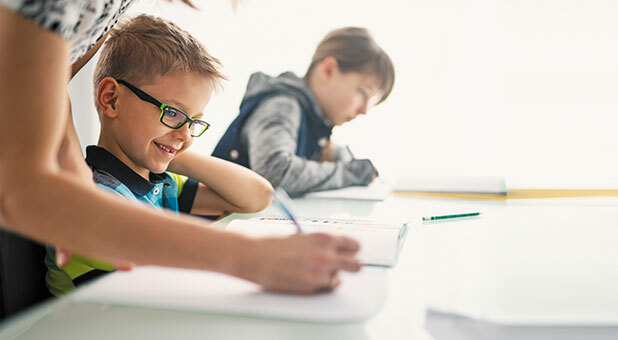 In schools, "There's an assumption that people, when they work with kids, have been adequately trained," said Mark Entzminger, national children's ministry director with the Assemblies of God. "That same assumption would also exist within the church, but many churches are focused on so many different areas that it can become difficult for them to create the appropriate standards for training and communication with the leaders to make sure everything's been implemented. Parents don't often think about the training that goes into it. I think there's an assumption that it's being done, which is all the more reason why churches need to be vigilant on training and equipping their children's workers to be effective." Most of all, staff must know they have a "spiritual mandate" to disciple, Delgado said. Merrill observes that "moms are much more fear-based," she said. "There's a lot more fear today. I guess it's just we know a lot more, and there are bigger churches. Parents are much more afraid. They have a lot more anxiety today, not just about safety but about health." Entzminger sees this as a difference between men and women. "Those are epic questions that Mom tends to ask more than Dad does. But also safety in the sense of, 'Are they going to be safe from bullying, or will other kids pick on them? Will they be accepted? Will they be welcomed?' If it's their first time, 'If my child is missing Mom or Dad, or they're unfamiliar with the area, how will I be notified? Are they going to keep my child crying for an hour and not call me? Or what's the plan to let me know if they need me if my child is not adapting well?'" Simon notes that "so many parents are more concerned about security than the curriculum used for their child. There's a difference, though, in how safety is defined today than in the past. Now, we prioritize both physical and emotional safety—a child must be safe and feel safe. "Peace of mind in children's ministry goes far beyond the Dutch doors installed in many children's ministry rooms (for visibility that's secure) and fingerprinting all children's staff and volunteers." Many churches have a matching sticker/check-in system. 'At check-in, a child gets one sticker while the adult who delivers the child gets the matching sticker," Simon said. "After Sunday school or an event, only the adult with the matching sticker can pick up the child." A safe environment is critical "with check-in and check-out, with knowing what kids are allergic to, with who's changing diapers," McLeod said. Author Iris Delgado, president of Crowned With Purpose Ministries and author of books including Satan, You Can't Have My Children and the upcoming Powerful Prayers to Protect the Heart of Your Child, agrees that safety and security are extremely important. "From the time they check in to the time they exit, there should be vigilant security, including when they go to the restrooms," Delgado said. Whiting adds that there should never be a time when a child is "left alone with one adult." Most of all, parents, especially if they're new to the church, need to be assured. "But if the child is struggling with coming into the environment, then it's a conversation of how you help calm them. 'You know what? We'll keep an eye on them for about five or 10 minutes. If not, this is the way I'll reach you, or I'll send somebody up to you in the sanctuary and give you a tap on the shoulder and just kind of give you a heads-up on how the child is doing,'" Merrill added. McLeod doesn't want a casual, happy-go-lucky kidmin leader. Rather, she wants a leader with vision. "I don't want them just to be passing time, just to get through another Sunday," she said. "I want them to have a long-range vision, so my children know more than just about Noah's ark and Daniel in the lion's den. I want there to be a vision for really training up children in the Word, in prayer and worship." On Facebook, Delgado received a comment from "a young mom who said she memorized psalms and other Scriptures as a young child in her children's ministry," she said. "When she was 12 years old, her parents divorced, and she never went back to church, but she always remembered the Scriptures she memorized, and with tears running down her face, she would recite Psalm 23. When she married at 19, she went back to church and took her 2-year-old straight to the children's ministry, hoping he would learn Scriptures, just as she had learned and survived through her traumatic experiences." Wildwood, Missouri, mom Christy Pitney is president of her children's elementary school's Parent Teacher Organization and a children's ministry volunteer. A mother of three, ages 12, 10 and 7, she believes one thing is most important to moms. "The thing that most attracts me to a children's ministry program is my kids' level of engagement," Pitney said. "I want my kids involved in a program that makes them want to go back, week after week, to learn about Jesus, whether that's because a caring small-group leader offered to coach my son's flag football team—yes, that really happened—or because they got to glue real sand on a piece of paper to make the shore of the Red Sea. I want a program that encourages them to engage with their faith, to realize that Christianity is fun and relevant." McLeod concurs, noting that "a children's ministry leader needs to build a culture among volunteers so that children's ministry is a happy place to be and to work. It's not stressful, but there's joy there." Listen to the podcast below to hear Dr. Iris Delgado share powerful prayers you can declare over your child.